Retallack returned to the site with the study's coauthors, including UO science librarian Dean Walton, in 2017. 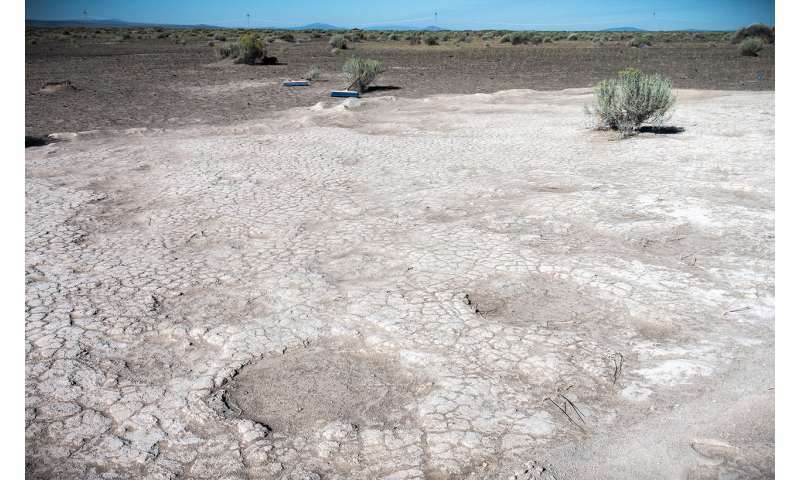 The team zeroed in on a 20-footprint track, dating to roughly 43,000 years ago, that exhibited some intriguing features. "These prints were especially close together, and those on the right were more deeply impressed than those on the left-as if an adult mammoth had been limping," said Retallack, also a professor in the UO Department of Earth Sciences and the study's lead author. But, as the study reveals, the limping animal wasn't alone: Two sets of smaller footprints appeared to be approaching and retreating from the limper's trackway. "These juveniles may have been interacting with an injured adult female, returning to her repeatedly throughout the journey, possibly out of concern for her slow progress," Retallack said. "Such behavior has been observed with wounded adults in modern, matriarchal herds of African elephants." "America's public lands are some of the world's greatest outdoor laboratories. Localities such as this mammoth tracksite are unique parts of America's heritage and indicate that there are many special sites still to be discovered," said study co-author Brent Breithaupt, a paleontologist in the Wyoming State Office of the Bureau of Land Management. Specimens from the 1876 Fossil Lake excavation-along with the rest of Condon's extensive assemblage of fossils and geologic specimens-were donated to UO in the early 1900s and form the core of the museum's Condon Fossil Collection, now under Retallack's direction and boasting upwards of 50,000 fossil specimens. Last month a new state law went into effect, making the UO museum Oregon's default repository for fossils found on state lands. The museum is also a designated repository for artifacts and paleontological specimens collected from BLM-administered lands in Oregon, ensuring they are available to future generations for education and research. As part of the 2017 study, Neffra Matthews of the BLM's National Operations Center in Denver, helped survey, map and document the trackway using photogrammetry, which helps scientists perform accurate measurements based on land-based or aerial photographs. "There is a vast storehouse of natural history found on BLM-managed land, and it's exciting to work with researchers like Professor Retallack in capturing 3D data on fragile paleontological resources," she said. "Tracks sometimes tell more about ancient creatures than their bones, particularly when it comes to their behavior," he said. "It's amazing to see this kind of interaction preserved in the fossil record."